This week's Next 20 community builder is Branislav Henselmann, Executive Director of Ballet BC. With studies in the sciences and business administration, and formal training as a dancer/choreographer/producer, Branislav understands how art and creativity are applicable to all careers and how they play a large role in understanding the world around us. For me creativity is re-contextualizing and transforming the experiences and the knowledge that we have into something new. It's actually just thinking, when you think about it. It's interesting that most of us don't really think about that imagination we have in us. All of us can imagine different outcomes and possibilities. For me, creativity is about taking that imagination and re-contextualizing it. That's the process of creation. That's where creativity starts. The issue though with creativity is that we live in what Germans call "The Eveningland" (the Western world) that is very much defined by outcomes. Today, creativity inevitably has a product attached to it. 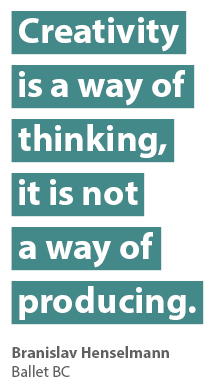 Creativity is a way of thinking, it is not a way of producing. I've always been interested in people. I want to know what drives people and what makes them tick. I talk to people to figure out how they see the world around them, in order to make the picture of the world for myself. I realized that I can only do this if I observe and talk to people. What does creativity look like in your professional life? I actually wonder whether someone really sits down and says, "Ok, I’m going to create a masterpiece today" and then goes on and does it. Our ballet company is one of the few companies that does not have a hierarchy. In fact, everyone is a soloist within a group because we are a creation-based company. Choreographers come from all over the world to create, and within the creative process, a soloist or a non-soloist emerges—and they are often very different because they are not chosen by choreographers but by the work itself. We face certain issues in the creation of dance like with any art forms. You can get bogged down in creating steps where a sequence of steps may actually be nothing. It may be the most beautiful steps but they may actually not make a whole that is in any way transcending. What do you think inhibits creativity? I don't know that anything really inhibits the development of creativity. We have this interesting conversation in the arts sector about whether adversity or plenty is good for the arts and we are totally divided. I don't know if adversity is bad for creativity. It might actually be good. What part of school did you connect with? I remember once asking my Russian teacher, "Why do we go to school?" He said, "so you don't invent things that have already been invented." We forget that a part of education is the systematic build-up of knowledge. I love school. I would've stayed as a student, if it was financially viable, for the rest of my life. I've always been interested in the idle accumulation of knowledge. It's borderline hoarding. But there are certain things in school I concentrated on. The sciences; I was always going to be a scientist. I did mathematics and, growing up, I also did physics and chemistry to a high degree. But I concentrated on mathematics and, of course, the arts. What are the skills, attitudes and knowledge that young people need to become creative, innovative and engaged members of society? Resilience and non-conformism. We're living in this globalized community, for better or worse. I think the biggest issue we will face is the loss of community as we see it. I wonder what we need to equip our children with in order to rebuild community? We as humans need our stories, it's what builds our communities—and this where the arts comes into place. The role of the arts is to tell the stories. At ArtStarts in Schools, we want to ensure that young people across British Columbia have opportunities to develop their own stories and creative potential and to build skills to thrive in the next 20 years—and beyond.